Horribly offensive or just comically twisted? Either way, it's not safe for work. Proudly offensive, grossly indecent and outrageously violent…if you wish to be. 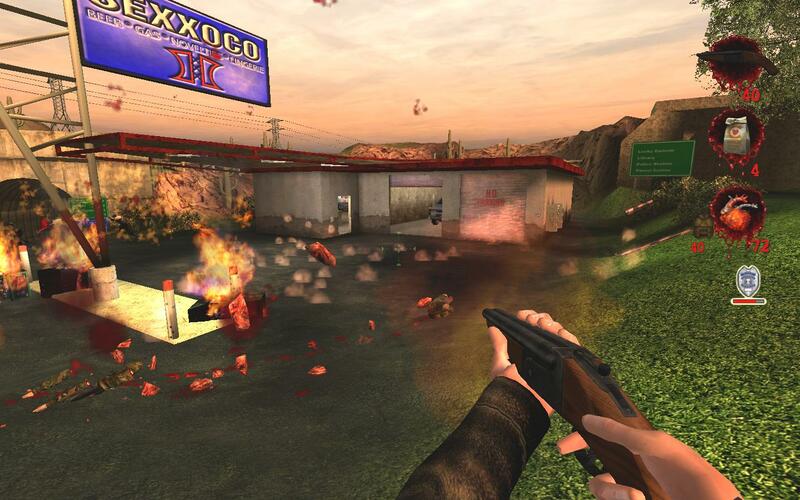 Postal 2 is a first-person adventure set in the town of Paradise, Arizona. You play as “The Postal Dude”, a man living low after his previous endeavors which left him on the verge of a mental breakdown. Now just trying to live a decent, law-abiding life, he finds the temptations of a town such as Paradise are just too much, and said vices draw him back into the realm of madness. The general goal each day is to complete chores. For example, on Monday you need to collect your paycheck, cash your paycheck, and get some milk. You can, of course, do all of these things as a law-abiding citizen, or you can complete them as an anarchist. For example, instead of cashing your paycheck, you could rob the bank vault. If you don’t want to pay for the milk, you could try leaving the store without it. As each day draws to a close, a new set of chores must be completed. They range from the mundane (go to your Uncle Mike’s birthday) to the absurd (go urinate on your father’s grave). Each presents its own problems and challenges to surmount, and with many of these chores there are more peaceful methods to complete them should you wish. Of course, if you choose to be violent, abusive, and outright abhorrent, you’re still accounted for. Oh yes. My personal favorite is exploding heads with a sledgehammer, although setting people on fire with gasoline and a match is also a timeless joy. 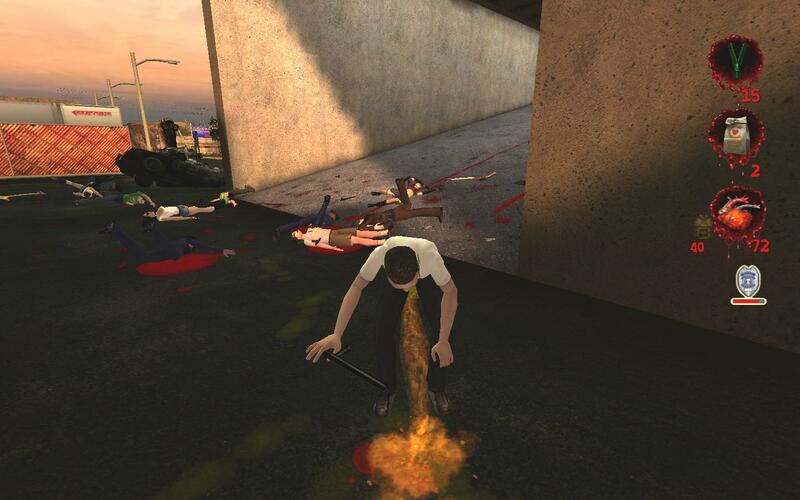 Perhaps you just want to unzip your pants in public and urinate in the face of passersby… Look, I’m not going to judge you if that’s what you want to do, but you should at least do it within the confines of Postal 2. The game is over ten years old now, and despite this, the most recent updates came to the game only last year. This update has been welcomed by both fans and newcomers, especially after Postal III left such a bad taste. In addition to Steam Achievements and Trading Cards, the game also contains updated textures and models (in places), a more fully featured editor, the ability to play the game and expansion pack together in one mode rather than separately, and “Enhanced Mode” which allows you to do ridiculous things like urinate fire. The expansion pack, Apocalypse Weekend, is also included in the modern re-release. The structure of the content is different, too; where Postal 2 is a free-roaming campaign, Apocalypse Weekend plays closer to a traditional first-person shooter, with clearly defined “levels”. The pacing of the expansion, as well as its method of storytelling, is also considerably different. It makes for a satisfying end to the game as a whole, but I find myself much more drawn to the main Postal 2 campaign for its enthralling design. In terms of the game structure and content, Postal 2 is surprisingly well-designed. The game environment can be tricky to navigate at first, but it is easy to get where you need to go, with road signs providing clues and, of course, a trusty map with your objectives conveniently marked in red ink. The game is very easy to pick up and understand, which is a massive improvement over the original Postal game and its poor controls. Most problems have multiple solutions, and secret areas provide a large amount of replay value. I am at 39 hours played, but I sense another 5 or 6 in just screwing around and trying to get the last few remaining achievements. Intentionally controversial, Running With Scissors and their Postal series have been in the line of fire from governments all over the world, having been banned in New Zealand, Australia, Malaysia France, Sweden and Germany. Since the worldwide re-release on Steam and GOG.com, it is unknown whether these original bans have been lifted in part or completely. Reasons for banning range from complaints that arose from the way the player can behave and the violent content present in the game, as well as the racial stereotyping and deliberately offensive material within the game. “People should lighten up a little” is what I would say if I didn’t find it mildly uncomfortable myself. Assassinating members of Al Qaeda, who are all made to resemble Osama Bin Laden, causes my skin to crawl massively. While I do feel that the deliberate stereotyping is tongue in cheek, and that the joke is based on how much of America sees terrorists, I still find it to be awkward. Perhaps it’s telling of me that I’m repulsed by this, and not the act of urinating on dead bodies or kicking a severed head around, or even playing fetch with a severed head and making a dog return it to me. I’m made uncomfortable by having to take part in ethnic cleansing of the Taliban, including women garbed in a traditional Hijab veil, but I’m not sickened by the ability to urinate in a person’s face, cause them to throw up, and immediately crush their head so that they continue vomiting from their exposed throat. I’m desensitized, mostly. But not when it comes to people’s feelings and beliefs, because that stuff is important. Because the content of Postal 2 is meant in a jovial fashion and is immediately comical upon the start of the game, it is much more acceptable than the original Postal, which is arguably much worse. In the very first installment of the series there are no humorous elements. The loading screens display hurtful, disgusting sentences that are meant to read like the ramblings of a madman. I can’t find enjoyment in that game, but with Postal 2, I can. Perhaps it is because The Postal Dude has been turned into a one-liner spouting, boot-kicking hero like Duke Nukem. Maybe it’s because the game has functioning controls. Maybe it’s because everything has been considered, even to the point where saving multiple times results in being told off by The Postal Dude himself, claiming that his grandmother could beat the game if she saved as often as I do. 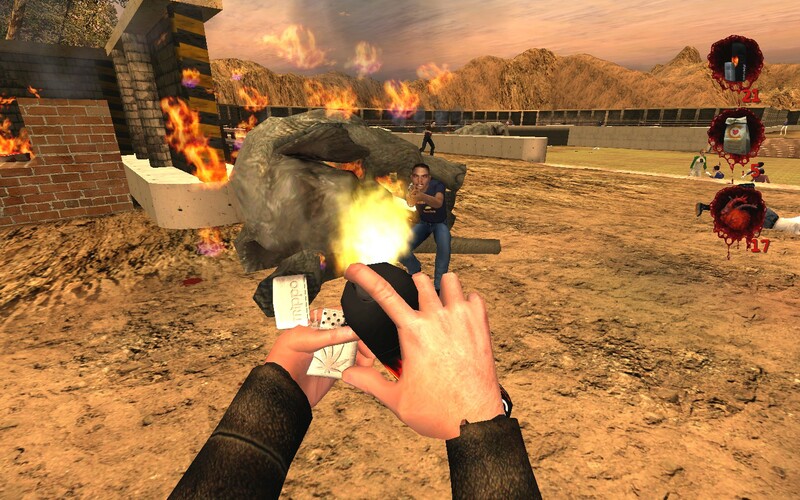 Postal 2 is a worthwhile way of spending your time. Although the game tries to convince you to commit acts of violence constantly (with townspeople opening fire on you or having to wait in long queues—aaagh! ), the question of whether you act violently, or how violent you are in the game, all boils down to how violent you want to be. If you’re like me, you’re going to get a kick out of the scythe.